Award-Winning REALTOR in Louisville, KY.
Found 93 blog entries published by Martin Crane. Just Listed in New Albany! 94 Wolfe Trace, New Albany, IN 47150 in the Wolfe Trace Neighborhood! Thursday, April 4th, 2019 at 7:28pm. Just listed and open house Sunday 4/7 2-4. You’ll love this awesome bi-level home with an open great room with gas fireplace, open eat-in kitchen, huge beautiful fenced back yard, owners suite with private bath and walk in closet, 2 additional bedrooms one with a vaulted ceiling, a second full bath, and a wonderful family room in the lower level! There is more! Additionally you’ll find some unfinished storage area off the utility room and a spacious 2 car attached garage. The back yard offers tons of entertaining spaces with the deck, large brick patio, and abundance of yard! Wolf Trace is a no outlet subdivision. Updates - water heater 2018, dishwasher 2018, front and back doors 2018, AC 2016, disposal 2016! Take a look at the photos! 408 Babe Drive for sale in Fairdale, KY, 3 bedroom 1.5 bath home built in 2005 with unfinished basement plumbed for a full bath! Open Sunday! Tuesday, August 7th, 2018 at 10:04am. This wonderful brick ranch is located in Holly Hills and is a stones throw from some of the best hiking in Jefferson County! The home offers an awesome covered front porch, great room with vaulted ceilings, well equipped kitchen with gas range, spacious dining area, master suite with private half bath, 2 additional large bedrooms, full bath conveniently located in the hall, a huge unfinished basement ready to finish that's rough plumbed for 2nd full bath, and a deck accessible from the kitchen/dining overlooking your partially wooded and private back yard! Recent updates include lots of fresh paint, new carpet, updated kitchen backsplash, and more! 15414 Beckley Hills Dr in the Hills of Beckley Station - just listed by Melanie Crane of Crane Realtors® and Open Sunday 2-4! Wednesday, May 30th, 2018 at 9:47pm. 11013 Fairway Pointe Dr in Indian Springs - just listed by Melanie Murphy of Crane Realtors® and Open Saturday AND Sunday 2-4! Friday, May 25th, 2018 at 12:52pm. Indian Springs Open House Saturday 2-4 & Sunday 2-4! Indian Springs is a lovely neighborhood that was once a popular golf course. Though you can no longer swing your clubs here, the beauty of the greens are still just outside your backdoor. The 1st floor features a large master suite with a private entrance to the fenced in patio, the laundry, a second bedroom with built in bookshelves, a half bath, a wonderful eat in kitchen with access to the screen in porch, and a very large living room and dining area. The 2nd floor is where you will find the loft, two additional large bedrooms and a full bath. Crane Realtors® welcomes new licensed Sales Associate, Meridith Hamilton! Congratulations Meridith on the big step! Thursday, May 10th, 2018 at 9:54am. Congratulations Meridith Hamilton for taking the plunge into a new career and thank you for choosing Crane Realtors® to pursue the next path of life. We look forward to making it a successful one! Please take a moment to read about Meridith, what she has accomplished, and congratulate her on the new career. Call her today for a professional real estate experience buying and/or selling your next home! Wednesday, July 12th, 2017 at 11:39am. Thursday, March 30th, 2017 at 11:41am. Just listed by Crane Realtors® and OPEN SUNDAY April 2nd, 2-4! Great brick home with 5 bedrooms, 3 full baths, 2 car garage, fully outfitted mother in law suite (in law suite has range, dishwasher, refrigerator) with no stairs to drive if needed, finished basement with wet bar, updated windows, updated baths (one has skylight), updated HVAC, new carpet and flooring, freshly painted, huge back yard and private patio, and much more! To note most of the 1st level (entry garage side with kitchenette, 2 bedrooms, and a full bath) is 2/3 above grade but per ANSI standards the 661 sq ft is lumped into the below grade portion. The basement is 500 sq ft finished. Call today - it won't be around long! Monday, January 30th, 2017 at 10:30pm. 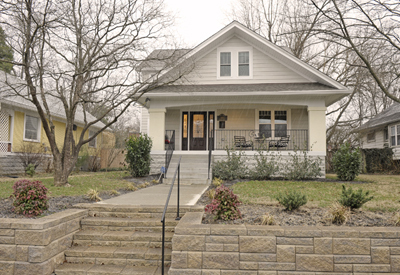 Open House 4702 Kiefer Rd, Louisville, KY 40216 - Open Sunday May 15th 2-4! Sunday, May 15th, 2016 at 11:50am. Just listed and OPEN SUNDAY MAY 15th - the SUNDAY AFTER MOTHERS DAY! Welcome to 4702 Kiefer Rd! This spacious cape cod has SO much to offer. It sits on a large yard of almost a 1/4 acre, has 1420 square feet of living space IN the home, 3 bedrooms, 2 and a half baths, 600 square feet of living space ABOVE the garage (2000 + sq ft total), an oversized 2 car garage with an extra beam able to handle an engine lift, and an enormous COVERED deck that spans 13 feet by 29 feet! The living room is open to the kitchen and dining area and has a fireplace, built in display shelving, and has an abundance of natural light. Open House 9533 Farmstead Ln, Louisville, KY, 40291 - Open Sunday May 15th 2-4! Sunday, May 15th, 2016 at 11:36am.